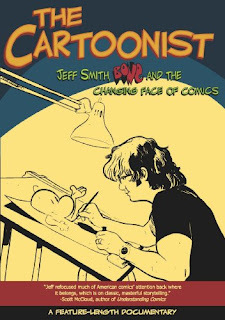 I finally got a chance to watch The Cartoonist, the 2009 documentary on Jeff Smith. I kept my eyes out for it when it was being shown on PBS, but I was surprised that I never saw it show up locally. Despite Smith being an Ohio native. Anyway, I got the DVD and had an enjoyable afternoon watching. The documentary itself is good. Multiple interviews from Smith, of course, as well as Scott McCloud, Colleen Doran, Paul Pope and a number of other folks. They traced Bone's origins back to Smith's doodles as a five-year-old through his college strip, his animation studio and ultimately Bone's journey from a small, self-published comic to something that was ultimately translated into 20 languages and picked up by Scholastic. It's a good narrative, and provides a number of examples of Smith's unpublished work. Also included on the DVD is the hour-ish long talk Smith and McCloud had at Ohio State University in 2008. This "In Conversation" piece covers a lot of the same territory that documentary itself does. In fact, several snippets of the talk were used in the film. So it was a little redundant in places, but I actually found "In Conversation" more than the documentary itself. Don't get me wrong; the documentary IS good and being able to see some of Smith's pre-comics work was interesting, as was getting some perspective from his wife Vijaya, but it seemed a little absent of Smith's engaging and entertaining personality. If you've ever seen Smith at a comic convention, you'll know what I'm talking about. He's very cheerful and personable, and comes across as just a really great, but unassuming, guy. Part of the reason his signing lines are so long is that he seems to enjoy just talking with whoever's in line. (The last time I saw him, he was conducting an ongoing conversation about the Star Wars movies with the next two or three people in line. He'd sign a book or two, and the person at the front of the line would thank him and move on, but he'd just start to include the next person in line in the conversation without missing a beat.) Because "In Conversation" is largely unedited, it's this more casual, friendly Smith that you see, going off on odd tangents, and trying to recall how he got around to talking about giving cigarettes to homeless men in San Diego while he had $2,000 in cash wadded up in his front pocket. The documentary, while not sanitized really, does come across as somewhat more formal. It certainly does a better job with the narrative of Smith's life and career -- Smith gets McCloud far, far off his notes during the very first question in "In Conversation" -- but it doesn't capture Smith's spirit as well, I think. But that's me and my personal preference. I knew a good chunk of Smith's history and career before watching either, so I'm not surprised I would gravitate towards the more obscure, anecdotal pieces because those are new for me. Plus I get to see Jeff Smith being Jeff Smith. The Cartoonist is a good documentary. Much of the same material is covered in "In Conversation." And since you get both pieces on the DVD, I might suggest you get a copy of it, and watch whichever one suits your preference. Both are worth it.